Sarah is a primary care/exotics registered veterinary technician and wildlife care clinic supervisor at Iowa State University Lloyd Veterinary Medical Center. She is pursuing her bachelor in applied sciences degree in veterinary technology from St. Petersburg College. 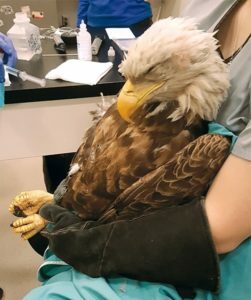 She is a licensed wildlife rehabilitator, certified veterinary technician specialist (exotic companion animal), and national certified veterinary technician. Her interests include avian anatomy, physiology, behavior and training, anesthesia, and exotic companion animal enrichment and husbandry. Animals can present with acute or chronic lead toxicity depending upon the amount and form ingested. Scenario: A fisherman finds a juvenile trumpeter swan (Cygnus buccinator) sitting quietly next to his favorite fishing hole. As he approaches the swan, he notices that she does not try to run or fly away. In fact, she appears to be too weak to stand or hold her head up. He contacts the local Department of Natural Resources officer, who immediately transports her to the nearest animal hospital. 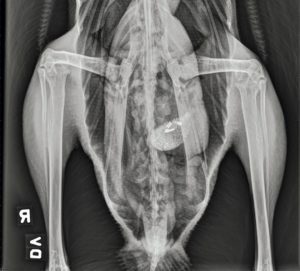 The veterinarian has seen similar clinical signs displayed by previous swan patients and immediately asks the veterinary nurse to collect samples to check blood lead levels and to prepare to take full-body radiographs. An estimated 20 million animals, including more than 130 differing species throughout the food chain, die each year from lead poisoning, according to the Humane Society of the United States.1 National attention to the impact of lead poisoning on waterfowl increased considerably in 1991 when conservationists estimated that 2 million ducks died annually from lead poisoning caused by ingestion of spent lead ammunition.1 To resolve the high mortality rate in waterfowl, the US Fish and Wildlife Service used their jurisdictional authority under the Migratory Bird Treaty Act to outlaw the use of lead ammunition to hunt migratory waterfowl and American coots (Fulica americana).1,2 Six years after the ban on lead ammunition was enforced, researchers found a 64% reduction in annual lead poisoning deaths in Mallard ducks (Anas platyrhynchos).2 However, lead ammunition remains widely used by hunters for other animals, despite the evidence that lead ammunition is detrimental to all wildlife.1 Twenty-six years after the 1991 ban on lead ammunition to hunt waterfowl, the lasting effects of lead in the environment continues to affect wild animals worldwide. 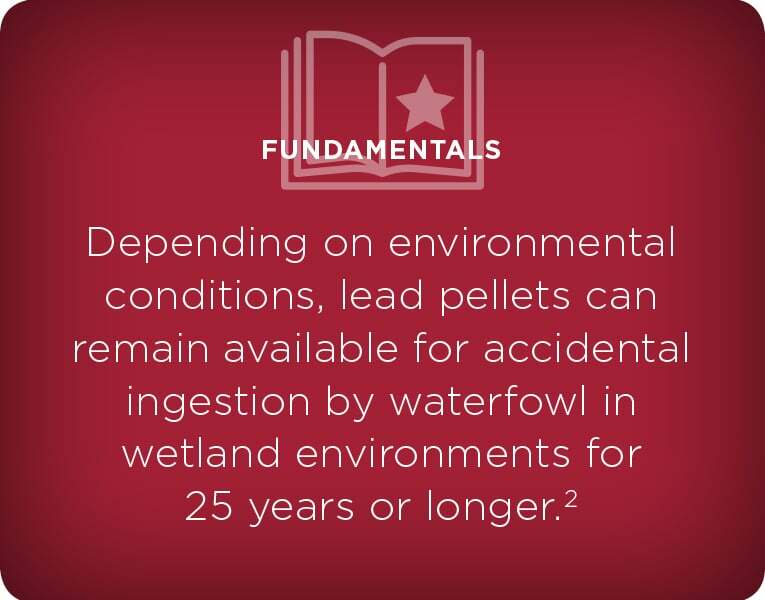 HOW ARE WILDLIFE ANIMALS EXPOSED TO LEAD? WHAT ARE THE CLINICAL SIGNS OF LEAD TOXICITY? FIGURE 1. Adult bald eagle at Iowa State University Lloyd Veterinary Medical Center displaying clinical signs of lead poisoning, including lethargy, weakness, wing droop, and ataxia. HOW IS LEAD TOXICITY DIAGNOSED? FIGURE 2. 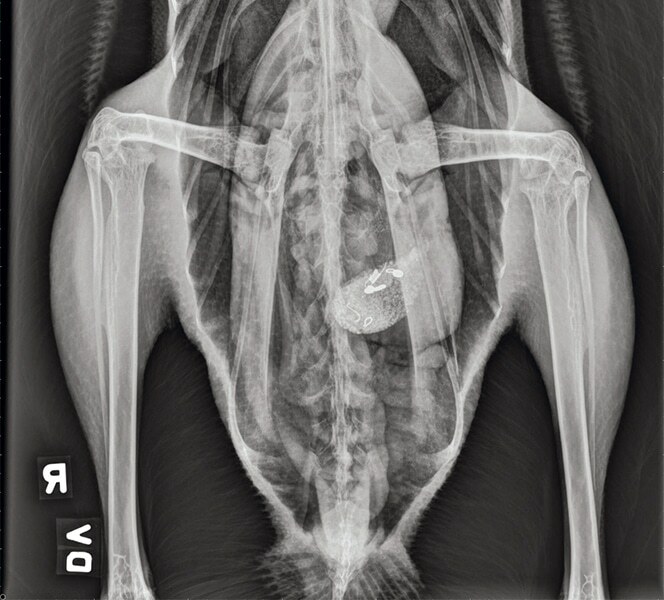 A ventrodorsal radiographic projection of a juvenile trumpeter swan revealing metallic objects in the ventriculus. WHAT ARE THE TREATMENT AND PROGNOSIS OF LEAD TOXICITY IN WILDLIFE? FIGURE 3. 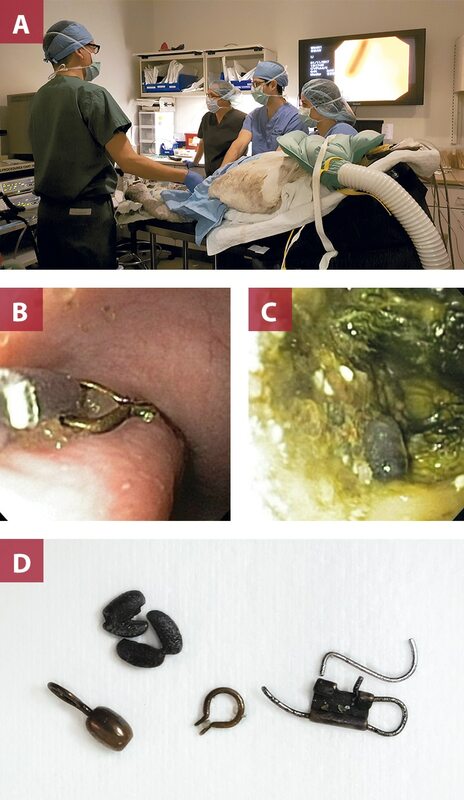 (A) An adolescent trumpeter swan undergoes an endoscopy procedure to remove metallic objects from the ventriculus. (B) An endoscopic image of a fishing hook within the esophagus. (C) An endoscopic image of a lead sinker in the ventriculus. (D) Fishing tackle after removal from the ventriculus using an endoscope. 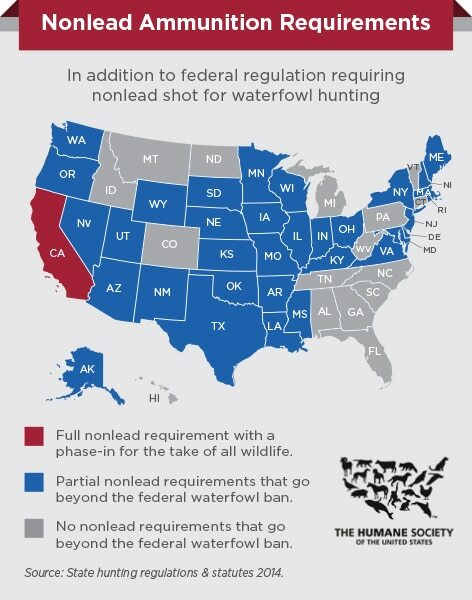 Individual states are recognizing the negative impact of lead on the health of wild animals.6 Thirty-four states have continued to expand restrictions on the use of lead ammunition and fishing gear beyond the 1991 federal ban on lead ammunition use to hunt waterfowl.1 Restrictions on lead fishing tackle are also becoming more common throughout the United States. To find out more about lead restrictions in your state, contact your local Department of Natural Resources or visit the U.S. Fish and Wildlife Service website (fws.gov). Humane Society of the United States. 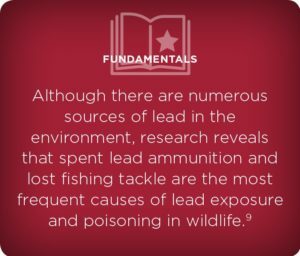 Lead ammunition: toxic to wildlife, people and the environment. 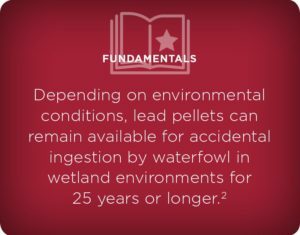 humanesociety.org/issues/campaigns/wildlife_abuse/toxic-lead-ammunition-poisoning-wildlife.html?referrer=http://www.opb.org/news/article/how-to-save-a-swan-from-lead-poisoning/ (accessed May 17, 2018). Haig SM, D’Elia J, Eagles-Smith C, et al. 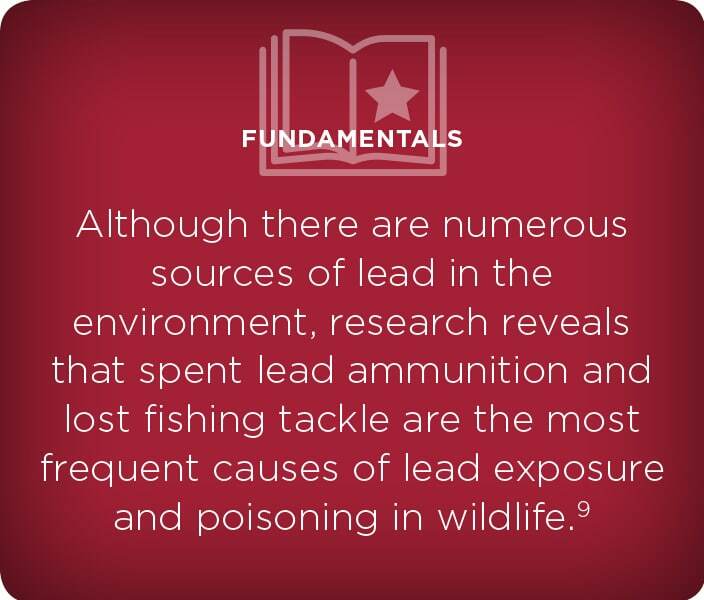 The persistent problem of lead poisoning in birds from ammunition and fishing tackle. The Condor. 2014;116:408-428. Harrison GJ, Lightfoot TL. Clinical Avian Medicine. Palm Beach, FL: Spix Publishing, Inc; 2006. National Wildlife Health Center. Concerns rise over known and potential impacts of lead on wildlife. U.S. Geological Survey. May 19, 2016. https://www.nwhc.usgs.gov/disease_information/lead_poisoning/ (accessed May 17, 2018). Pacelle W. U.S. Fish and Wildlife Service says it’s time to ban lead ammo, fishing tackle on federal lands. Humane Society of the United States. January 17, 2017. blog.humanesociety.org/wayne/2017/01/u-s-fish-wildlife-service-says-time-ban-lead-ammo-fishing-tackle-federal-lands.html (accessed May 17, 2018). Moazeni M, Alibeigi FM, Sayadi M, et al. The serum lead level in patients with retained lead pellets. Arch Trauma Res. 2014;3:e18950. Puschner B, Poppenga RH. Lead and zinc intoxication in companion birds. Compend Contin Educ Vet 2009;31:E1-12. Golden NJ, Warner SE, Coffey MJ. A review and assessment of spent lead ammunition and its exposure and effects to scavenging birds in the United States. Rev Environ Contam Toxicol 2016;237:123-191. Ritchie BW, Harrison GJ, Harrison LR. Avian Medicine: Principles and Application. Abridged edition. Lake Worth, FL: Wingers Publishing Inc; 1997.